Researchers have found that peat has high potential to replace commercial compost in MnDOT’s standard bioslope and bioswale design for roadside ditches, and that taconite tailings performed comparably to the sand currently specified in MnDOT designs, with the additional benefit of removing phosphates. Finding alternatives to commercial compost and sand for use in bioswales will help MnDOT meet regulatory requirements for stormwater runoff, while reducing the costs and environmental effects of transporting and storing these materials. “The results of this project will very much facilitate the development of green infrastructure by reducing its cost to MnDOT and Minnesota local agencies, helping them to do more with less,” said Dwayne Stenlund, Erosion Control Specialist, MnDOT Erosion Control and Stormwater Management. The objective of this project was to evaluate peat and muck excavated from construction activities, taconite tailings from area mining operations, and other stormwater quality filter media for use in bioswales and bioslopes along Minnesota highways. Laboratory and field tests of these products would examine their capacity to absorb water, retain pollutants and support plant growth to determine if they are beneficial and practicable in these designs. For field tests, researchers created small plots using either peat or compost mixed with native soil. Researchers began by conducting a comprehensive literature review on the use of bioslopes and bioswales as stormwater treatment best management practices. Then they collected peat and muck near a highway construction project, as well as locally sourced sand, compost, taconite tailings and commercial peat. 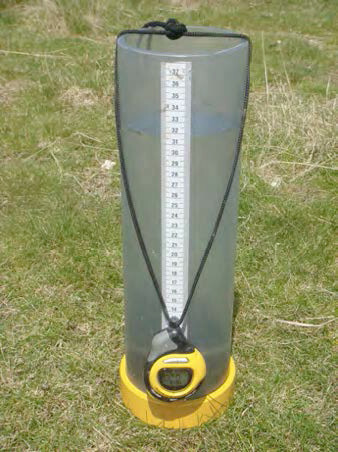 Absorbed water, using a falling head test to measure saturated hydraulic conductivity, which indicates the rate at which water infiltrates a material. Retained pollutants, using leaching experiments to quantify how well they removed copper, lead, zinc, nitrate and phosphate. Sustained plant growth, using bioassays and greenhouse studies. Finally, researchers conducted pilot field tests on three plots containing a 50/50 percent peat and sand mixture, and another three plots with a 50/50 percent compost and sand mixture. Between April and August of 2017, they monitored water infiltration, discharge water quality and vegetation establishment for these sites. “Ultimately, a combination of peat and taconite tailings will compare favorably with current MnDOT specifications for bioslope and bioswale design,” said Kurt Johnson, Research Fellow, University of Minnesota Duluth Natural Resources Research Institute. Researchers found that peat has a strong potential for replacing commercial compost in MnDOT’s standard bioslope and bioswale designs, and that taconite tailings also performed comparably to the sand currently specified in these designs. However, muck has little potential to replace commercial compost or peat due to its low permeability, poor infiltration and filtration properties, and lack of support for plant growth. Infiltration rate: While muck had an unacceptably low hydraulic conductivity, peat performed at least as well as compost, and taconite tailings as well as sand. Pilot tests showed that a 50/50 mix of peat and taconite tailings had a similar water storage capacity to a 50/50 mix of compost and sand. Pollution retention: Muck absorbed only 50 percent of metals; salvaged peat, commercial peat and compost performed well, absorbing more than 80 percent. However, only taconite tailings showed the potential to remove phosphate. None of the materials removed nitrate. Plant growth: Mixtures of compost or peat with sand or taconite tailings all performed well in providing a viable substrate for plant growth. Mixes containing compost performed the best in plant growth trials. Muck was difficult to mix with any other material, and its value for plant growth was minimal. Greenhouse study results showed no difference between sand and taconite tailings in their effect on plant growth response. In a second phase of this project, “Development and Regionalization of In Situ Bioslopes and Bioswales,” MnDOT will conduct further laboratory tests on alternative materials for bioslopes and bioswales, and expand field tests to several sites in Minnesota that have been constructed using these materials. Researchers also recommend the development of specifications and detail drawings for the use of these materials. This blog pertains to Report 2017-46, “Comparing Properties of Water Absorbing/Filtering Media for Bioslope/Bioswale Design,” published November 2017. Stormwater can pick up chemicals and sediments that pollute rivers and streams. Roadside drainage ditches, also known as swales, lessen this effect by absorbing water. But until recently, MnDOT didn’t know how to quantify this effect and incorporate it into pollution control mitigation measures. In a recently completed study, researchers evaluated five Minnesota swales, measuring how well water flows through soil at up to 20 locations within each swale. A key finding: grassed swales are significantly better at absorbing water than expected, which may reduce the need for other, more expensive stormwater management practices, such as ponds or infiltration basins. This could save MnDOT and counties significant right-of-way and construction costs currently expended on more expensive stormwater management techniques. While swales were recognized in the Minnesota Pollution Control Agency’s new Minimal Impact Design Standards, there was a need to quantify the amount of water a swale can absorb so it could receive the appropriate MIDS credits. Researchers also tested the ability of carbon, iron chips, steel wool and other materials to remove pollutants as ditch check filters—material put into swales to enhance removal of pollutants. Gradations on a Modified Philip Dunne infiltrometer allow the measurement of stormwater infiltration. A follow-up project, which the MPCA is participating in, will seek to clarify the impact of swale roughness on infiltration rates. The goal is a calculator for real-world infiltration rates that MnDOT and local agencies would be able to implement. MPCA, MnDOT and the city of Roseville are also partnering on a project to install and test the effectiveness of ditch check filters in real-world locations. Maintenance recommendations should help MnDOT and local agencies ensure that swales operate at maximum efficiency. These recommendations should continue to be revised as knowledge evolves. *Editor’s note: This article was adapted from our upcoming edition of the Accelerator. Read the newsletter online, or sign up to receive by mail.